With all of the hype created around school choice by Betsy Devos and President Donald Trump, people are starting to consider this as a real option. Indeed, the idea that all students can choose where to learn sounds quite enticing. But school choice isn’t just some attention-grabbing tagline, it is a real decision which has real implications for all of our nation’s students. As such, it is important for each of us to try to develop an informed opinion about the matter, based on what is really happening. 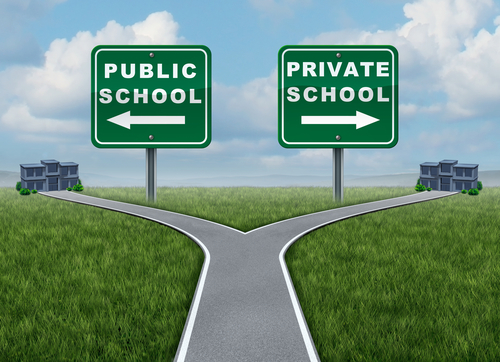 School choice is when students are given the option of utilizing the funds that would have gone toward a standard public education, in order to study in a charter school or private schools. In the case of charter schools, the schools are mostly run by public funds, but they are managed by private corporations. Private schools are completely independent, but school vouchers allow public funds to be redirected toward them. In other words, school choice gives students the financial means to choose where they want to learn, rather than having to attend the local public school. Who benefits from school choice? Having a choice of school would, in theory, benefit all students. When each child (or their parent) has the power to choose where they will learn, anyone can benefit from studying anywhere. It would seem that this would be particularly beneficial for low-income students who would not have been able to afford private schools otherwise. Additionally, any child with a low-performing neighborhood school could easily get a better education by choosing to study somewhere else. The schools will in turn be encouraged to improve because they want to attract more students so they will have more funding. All students will be equally desirable to schools because they will all be in an equal position to bring the full tuition to the school. Are there any cons to school choice programs? Let’s be honest, if there were no drawbacks to school choice, we would already have it as a national program. The truth is, there are already some states which are allowing students to attend their school of choice through voucher programs, so we don’t need to guess whether this is a good idea or not. It turns out that when students get to choose where they study, many choose charters, magnets and private schools. This causes the neighborhood schools to close because of lack of funding. When neighborhood schools close, students are forced to travel extreme distances just to get an education. If the schools they are travelling to are much better than what was previously offered close to home, then maybe it would be worth it. However, there is no proof that charters automatically outperform traditional public schools. Of course there are many exceptional and successful charters, but unfortunately that does not characterize every single one, or even the majority. The fact is that in many charters, student performance is exactly the same as it was in the neighborhood schools, only now students have to travel great distances in order to get the same education that was available to them in the first place. Who pays for school choice? Tax dollars pay for school choice, just like they pay for traditional schools. Only in this case, all students get to choose where the funds that would have automatically gone to neighborhood public schools will go. This saves parents a lot of money and allows low-income students to attend private schools. Opponents of school choice say that, if the idea is to allow everyone to benefit from their own tax dollars, this system is unfair as well. What about the childless, or those whose children are already grown? Should they get a tax break or be allowed to earmark those funds for something else? If they were allowed to choose where the money would go, then schools would have even less funds than they already do. The bottom line is that school choice is a complicated issue. In a system where everyone gets a chance to choose, that doesn’t necessarily mean that everyone makes the best decisions. There are additional complicating factors as well, such as travelling great distances, and the enrollment capacity in any given school. Whether you are for or against this idea, it is important to look at all of the pros and cons of school choice before forming an opinion.